People with a green or have green in their aura have strong empathetic tendencies, natural healers and a natural empathy to nature. To see the light green of fresh growth turn dark as it matures, watching grass go light after rainfall, people with green auras are the most variable in nature. The strength of the green is determined by their strength of character on any given day. People with a Green or have predominantly green in their aura are creatures of love, also creators of love. “Love without reserve and love life”... should be the motto for these people. To be able to love unconditionally is a gift bestowed on very few people, people with a green aura seldom escape without the presence of blue. The blue will appear at the edge of the aura, coming in from the left. The green is the growth of life from light green to dark green, to appreciate the love will lead to sharing and with sharing comes healing and comes communication, from the centre of the heart is a thread of blue that is so pure to the untrained eye it appears silver. The purity of this thread that stems from the centre of the Heart Chakra will only be as pure as the person carrying it. It appears and disappears as life moves through its ceaseless cycle of emotion. Emotion is dependent on the workings of external references, the comparable essence of physical reality, habitual tendencies and environmental conditioning. As this person moves through life, dying, death and the afterlife, the thread of blue that stems from the heart will develop and envelope this aura. The aura will become perfectly shaped, balanced and visible. The healer from within this aura will be recognized. The Heart Chakra governs this aura, its tendency to love unconditionally affects the balance of the lower earth tied chakras and the higher and lighter ascending chakras. This is the Chakra that lets go of the density of physical reality, as Ivy will feed a horse in the forest, with the horse choosing the light green shoots and leaves. The dark green leaves shield the new growth and the Ivy grows out of reach of the horse. The vine will grow from light green stems, stretching upwards before turning dark to produce fruits of the vine and accepted as the blood of Christ across the Christian lands. Both eaten and drunk with altered states induced, to ascend and to leave the density of physical reality behind. 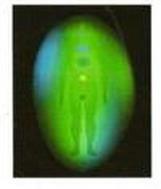 A green aura demonstrates balance, just as a thermometer will gauge temperature this aura is a gauge to balance. Body, mind and spirit in balance will produce a glorious emerald effervescent glow. The horse will be heard and seen as a messenger, the horse is considered to be the totem and a representation of the goddess “Epona” love, fertility and abundance will be brought forth. The swans bring quiet and majesty, love, fertility, fidelity are but a few of the qualities appreciated, that will contribute to the green aura. With the coming of Freya and the coming of spring, Arch Angel Raphael is present and can be seen or called to stand with people with a green aura. A perfect time for this person to balance and meditate would be before sunrise in the spring. Totem Entities: Snake, Swan, Horse. From the soft light green of new growth to the mature green of aged established life, people with a green aura are the servants of every community. A life of servitude, kindness, healing & caring are the abundant life force streams that reach out to others. Teaching or learning are the hardest lessons to master, the balance once achieved will make these people natural leaders.